Extreme crosswind landings can be terrifying, and yesterday, pilots in the Netherlands were thrown into the crucible when the worst storm in 100 years rocked Amsterdam’s Schiphol Airport with winds up to 75 miles per hour. 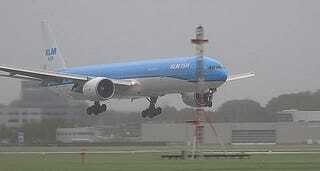 This incredible video shows a KLM 777-300ER pitching and rolling until the last possible second. Crosswind landings are among the most difficult situations that pilots must overcome. The delicate ballet of control inputs is a test of both skill and confidence. Beyond being a true testament to pilots’ skills, however, they also make for great videos!